Figuring out how to pay for college can be overwhelming, for sure. But the good news is that there are probably more college funding sources than you were aware of — and you don’t need to be a rock-star student or demonstrate financial need to qualify for all of them, either. In fact, right now it’s easier than ever for Texas residents to attend college. That’s because of Texas 60x30, a statewide program that aims to have 60% of Texans (ages 25-34) graduate with a college degree or post-secondary certificate by 2030. The idea is that the State of Texas can flourish if more of the state’s residents are qualified for well-paying jobs. Plus, an educated workforce can act as a draw to bring more desirable employers to the state. How can you start your own college journey? Let’s discuss the four steps all Texas residents should take to fund a college education. No matter where you live or where plan on attending college, filling out the FAFSA form is your first step in paying for college. FAFSA stands for Free Application for Federal Student Aid. We’ll be honest: it’s not a fun form to fill out. (Check out our handy guide if you have questions about it.) However, completing the FAFSA is a necessary gateway to pass before securing financial aid. You do not need to have your college acceptance in-hand in order to apply for FAFSA, so there’s no need to hold off on applying. In fact, the sooner you apply the better, so you don’t miss out on grants that may have application deadlines. As we just mentioned, you will automatically be evaluated for eligibility for some state grants after you fill out the FAFSA. Non U.S. citizens who are Texas residents may apply for state funding by completing the TASFA, which is the Texas Application for State Financial Aid. The TASFA is designed to provide college funding for students who don’t have Social Security numbers and who are unable to receive federal aid through FAFSA. In addition to grants, Texas offers many scholarships based on financial need, merit, service in the Armed Forces, or program of study. For a complete list of federal and state grants and scholarships, go to CollegeforAllTexans.com, a website run by the Texas Higher Education Coordinating Board. There is also an extensive list of exemptions for people who may be eligible for free tuition and/or fees. If you’re a current high school student, set a calendar reminder to regularly check in with your high school guidance office to keep current on local scholarships. The Rotary Club, Kiwanis, and other civic organization often offer scholarships to students in local communities. It’s always a good idea to do your own searches online as well. Many public and private colleges in Texas offer scholarships, so be sure to search on school websites or call their financial aid offices. Texas state colleges have a wide array of scholarships for different courses of study, specific campuses, and varying levels of financial need. For example, the University of Texas offers scholarships for several campus locations, including Arlington, Dallas, El Paso, San Antonio and Permian Basin. Other state schools such as Sam Houston State University, Texas Tech University, Texas A&M University, Midwestern State University, Lamar University, and the University of Houston also offer multiple scholarships. Scholarship dollars are available from other sources throughout the state as well. The Communities Foundation of Texas administers over a million dollars in scholarship funds for various organizations every year. You can search for scholarships and apply online here. 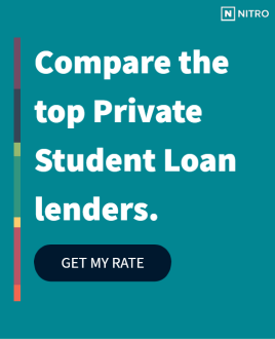 If you’ve exhausted all of your options for grants, scholarships, and federal loans, a private loan can help you make up the difference that you’ll need to fund your education. Before taking out any Texas private student loan, check out our free NitroScore tool. Simply enter a college and major to find out your total costs, salary after graduation, potential loans needed, and a score that tells you how easy those loans will be to repay based on projected salary. You can then customize the results with info about scholarships, grants and savings — and even compare different college/major combinations. From there, you can find out who can give you the best rate from our trusted and highly vetted loan partners. A college education doesn’t need to be out of reach for Texas residents. Start planning for your future today.